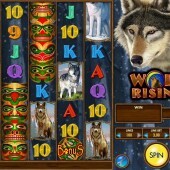 Wolf Rising is an IGT-developed slot that adds to the strong online slots portfolio of wolf-themed slot games. We have seen a range of wolf-themed slots arrive on the scene over the years and generally they do end up being quite enjoyable slots. 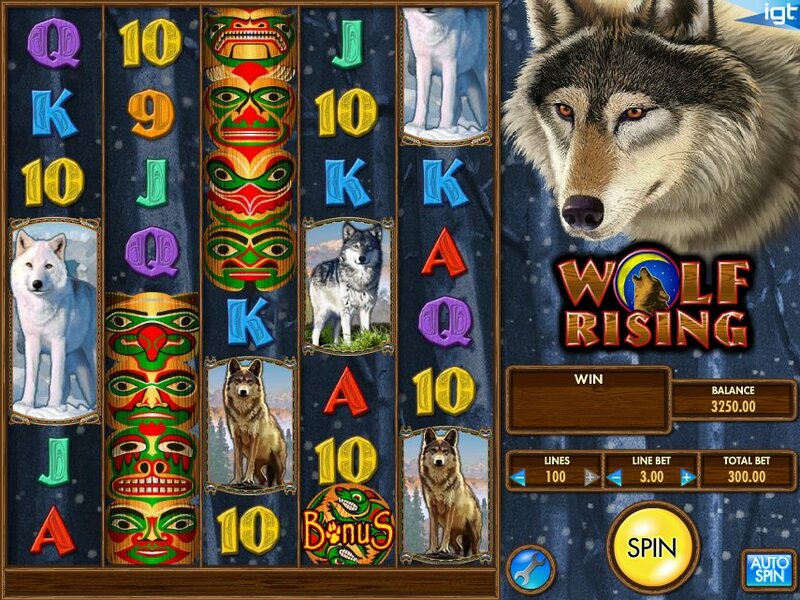 The two main examples I would have to use are the Wolf Run slot by IGT, which could essentially be labelled as the predecessor to Wolf Rising, and the Untamed Wolf Pack slot from Microgaming. Both slots are on my list of all time favorites and I was very much looking forward to playing Wolf Rising. The fact that it was also released by IGT was also an additional incentive for me to get my hands on the reels. It is a 5 reel, 100 payline slot and interestingly it has an incredible 8 rows of symbols meaning that there’s more room to hit some winning combinations across the reels on this slot. The reels are positioned on a backdrop of a snowy landscape and symbols on the reels include various wolves along with the standard 9 through to Ace symbols. The Totem symbol acts as the Stacked Wild on this slot and will substitute for all other symbols, except for the Bonus symbol, to complete winning combinations and pay out some decent sized wins. Earn up to 255 Free Spins! The only bonus feature on this slot is the free spins bonus round. You can trigger this by hitting three of the Bonus symbols on the three central reels. That gives you 24 symbols worth of space to try and hit those Bonus symbols. That probably explains why you only get 5 free spins but the chance of triggering those free spins is higher than on other slots. Another benefit is that the three central reels will include Stacked Wild symbols which enhance your chances of completing winning combinations. The free spins can also be re-triggered so you can earn up to 255 free spins if you get lucky. That is surprisingly it for bonus features on this slot but the increased number of rows on this five reel slot will ensure that the action is frantic. The free spins bonus round itself is very compelling with the inclusion of the Stacked Wilds a stroke of genius. However, it might not be to everyone’s taste with bonus addicts feeling a little short changed. IGT have a solid reputation in the slots world and to be honest I found it refreshing to review a slot that took a different angle and didn’t just have the simple free spins bonus round and Pick ‘em Bonus format. The large number of symbols and potential to hit winning combinations on every spin gave the feel that anything could happen at any time on this slot and I liked it. It might not be for everyone but, yes, I certainly would play it again.